Circa 1982: I was nineteen. I travelled cross country by Greyhound bus, from New York to St. Louis to Salt Lake City to San Francisco; north then to Seattle, then east to Bismarck, and back to New York. I could fit comfortably in a bus seat then, and I loved watching the open road ahead of us. 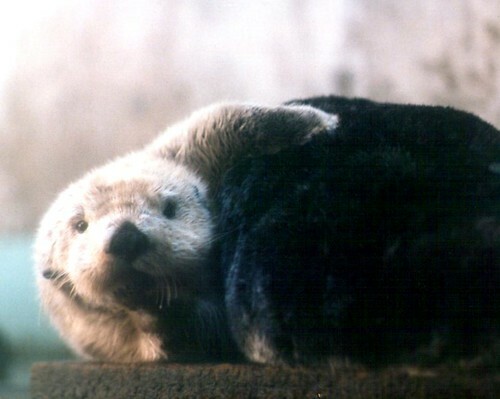 I photographed this otter at the Seattle Aquarium when I was there, and they were holding a photo contest for shots taken at the aquarium. I was on my way to visit my stepmom in Bismarck, which was something like two days away, and depending on travel time and photo-processing time, I could just make the deadline. I know this image placed in the contest, and I’m pretty sure it was third, but now that it’s thirty years later, I can’t find the award announcement. It may turn up, it may not. I’m having a crisis of faith in my photography. What I want to do, and what I am capable of doing are warring with each other, and I’m finding I have a hard time pulling it out of myself to keep going forward. The images, the photography … this is how I see the world. I just don’t know if anyone cares. I CARE. You do lovely work. I mean that.